The simple life of the starving artist is much more than a Romantic literary and painterly trope – for many artists, measly living is reality. With the fame they garner now it’s hard to imagine that modern figures like Andy Warhol or Salvador Dalí would have needed to supplement to their artistic incomes. But, we’ve found the advertisements that prove these side ventures. Salvador Dalí for Old Angus scotch whisky, 1951. Surrealist artist Salvador Dalí who once declared, “I myself am Surrealism,” made another bold statement in 1951: that Old Angus brand scotch whisky is “really tops.” Dalí lends his image and endorsement to the liquor, however it wasn’t the first time he had delved into the world of advertising. The artist had worked as an illustrator in the 1940s and ran his own print publication, Dalí News, around the same time. This color magazine ad ran in American publications when the artist was living in Spain but writing articles about modern art theory for prominent United States titles like Vogue and Herald American. He had a long-running relationship with Vogue, designing several Surrealist covers for the fashion magazine. Marcel Broodthaers for van Laack, 1971. 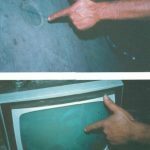 Belgian artist Marcel Broodthaers gained fame for his conceptual artistic stagings critiquing the art world bureaucracy of the late 1960s and early 1970s. In a particular example from 1968, the artist creates a mock American modern art museum with himself as director of the department of eagles. Just a few years later while living in Berlin, Germany, he agrees to pose as another figure, this one farther from the artistic world. 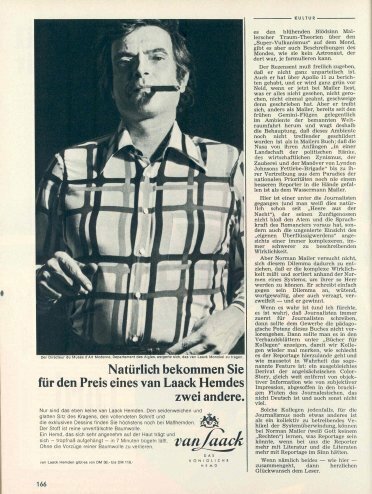 In this banal German advertisement for men’s shirts, the Belgian artist becomes the model, in a starched, patterned dress shirt. 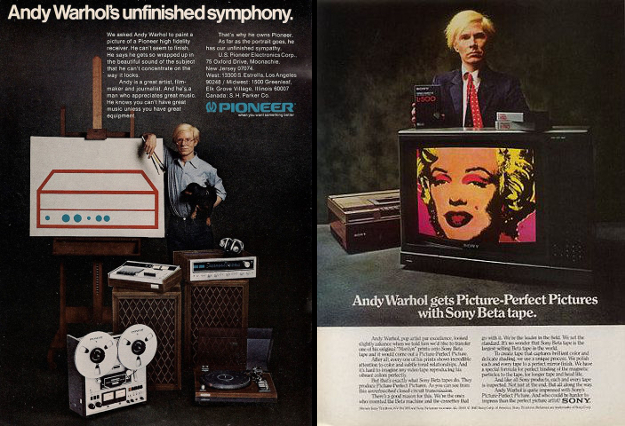 Left: Andy Warhol for Pioneer, 1975; Right: Andy Warhol for Sony Beta Tapes, 1981. 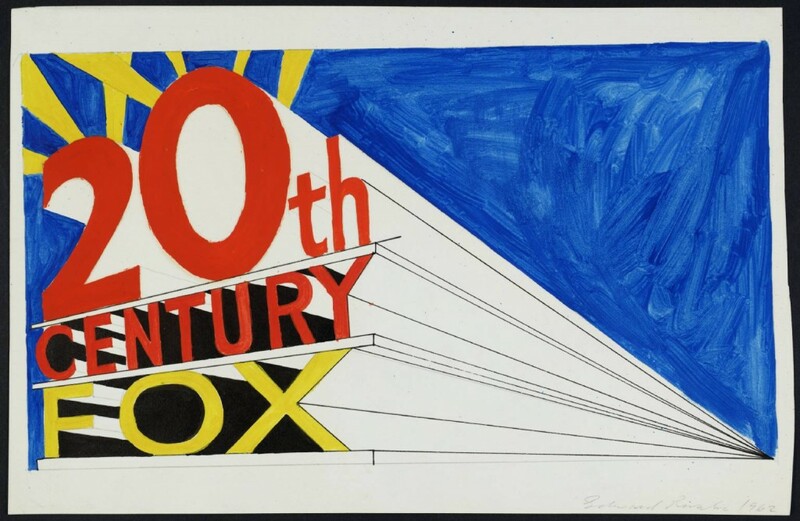 Also working the 1960s and 1970s, Andy Warhol’s artwork is heavily influenced by the commercial advertising he encountered as every day, and by his background as an illustrator. From repeating soup cans or Coca-Cola bottles, his art took the popular image and inundated its viewer. However, a few times Warhol did in fact lend his own image to a commercial advertisement. Above are two ads for audio and visual recording products. Considering the artist’s obsession with consumerism, there is surely a subversive message behind his endorsements. Helen Frankenthaler for Rolex, 1990. Quite the opposite of a subversive message, however, is found in this advertisement for Rolex watches. Artist Helen Frankenthaler gives a poetic endorsement of the luxury wrist wares, surprisingly in the same year – 1990 – that she was given a solo retrospective exhibition of her Color Field paintings at New York’s Museum of Modern Art. The ad ran in Art & Antiques magazine, possibly alongside a review of her show! 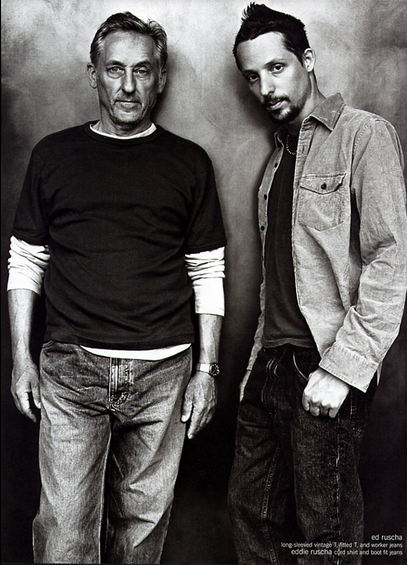 Ed Ruscha (left) and son, Eddie Ruscha (right), for Gap, 2002. Image via Ad Forum. An artist known for creating advertisements becomes an advertisement himself in the above image. For Gap clothing, Pop Art graphic designer Ed Ruscha models with his son Eddie Ruscha in the baggy styles of the early millennium. It is 2002, after all. Trademark #5, Ed Ruscha, 1962. Image via Tate Museum. Fast-forward to even more recent times and another modern artist is lending her image to product. In 2011, Cindy Sherman launched a line of M.A.C. cosmetics and posed for the campaign wearing her consumer goods. Sherman is known for her photography and styling work – for transforming herself into physical versions of female tropes. Here, she subverts the typical glamor of a makeup advertisement, even including an image of herself as a clown in her new line: a true take on the sexist phrase “clown makeup,” when an outside viewer believes a woman has painted too much product on her face. Images via thefineartblog. Photographs by Cindy Sherman. 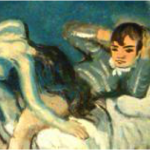 The visual link between art and advertising has inspired interesting explorations across media. There modern artists’ deviations into the creation of advertisements or the endorsements of consumer products may have been fiscally motivated; however, those who partook were often of the avant-garde variety. Perhaps, these ads could be seen as another kind of cultural commentary? 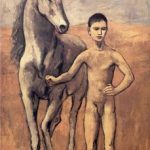 This entry was posted in Popular Culture and tagged advertising, Andy Warhol, cindy sherman, commercial art, helen frankenthaler, marcel broodthaers, salvador dali on July 9, 2015 by wpuser.